Going camping is great, whether you’re heading far away or even staying in your own backyard, but you need the right tools. A great tent is the first thing you’re going to need and one that includes a hammock is even better. The best hammock tent for you is, hopefully, one of these right here. Just take a look and you’ll see why they’re a great choice for you. Capacity: How many people can fit in the tent itself? You don’t want something too big since you’ll need to carry it wherever you’re camping. You also don’t want anything too small since your family won’t fit. 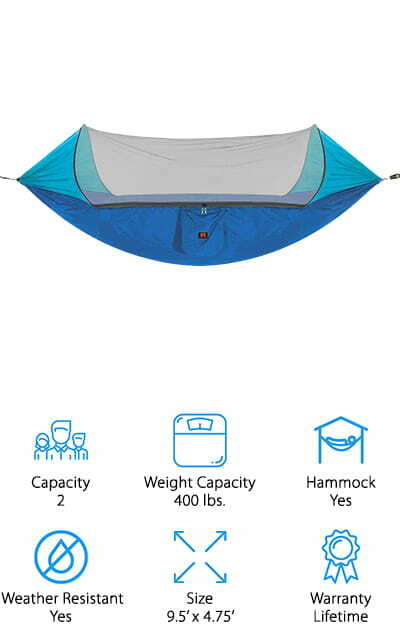 Weight Capacity: How much weight can the hammock inside the tent actually hold? You want to make sure that you will comfortably fit and that you have at least a little bit of extra weight available when you lay down. Hammock Included: Is the hammock included or do you need to buy it separately? You’ll want to at least know this though whether it’s an important factor for you or not is going to be your personal preference. Weather Resistant: No one wants to get wet while they’re camping but you can’t always predict the weather. Making sure your tent is weather resistant is one way that you can help protect yourself from anything. Size: The actual dimensions of your tent will also help you figure out if you and your family will fit comfortably and if all of your stuff will fit. It will also help you to know where you’ll be able to set up at night. 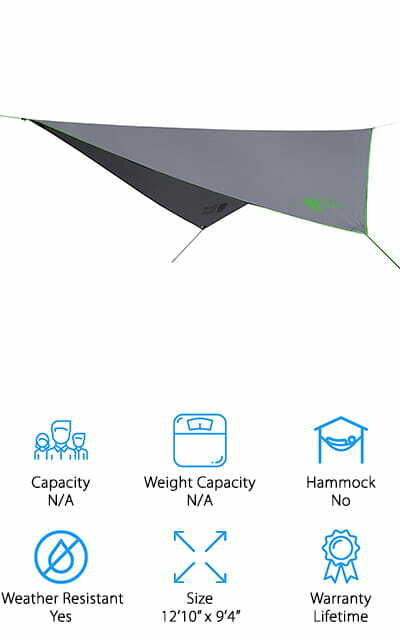 Warranty: What kind of warranty is included with the tent? The longer the warranty the better you know the company feels about it because they’re willing to stand behind it and say it’s going to last as long as you need it. There are way more tents out there than anyone could even list, but we’re going to focus on hammock tents. The best camping hammock tent is definitely out there and it’s something you’ll want to find sooner rather than later. Hopefully one of these is going to do the job for you and get you and your family out there camping right away. Our best hammock for sleeping is actually a double hammock that is completely bug and mosquito free. It’s made with lightweight, ripstop nylon and is totally reversible as well. On top of that, it comes in several colors for your personal preference and has everything you need to get it set up and ready to go. You’ll get filament webbing as well as carabiners, the hammock itself, netting, a pouch, compression straps, net rope and tree saver straps. Rated to 400 pounds, it’s made with a parachute quick dry fabric so you don’t even need to worry if it gets wet. The setup process is quick and easy so you can get back to doing the things you’d rather be doing while you’re out in the wilderness. The spacious design is great for 1 person or even for 2 to sit and sleep more comfortably, with or without the mosquito netting to help make your night more comfortable. If you want to enjoy your next camping trip but don’t want to spend a whole lot of money this is a great way to do it. 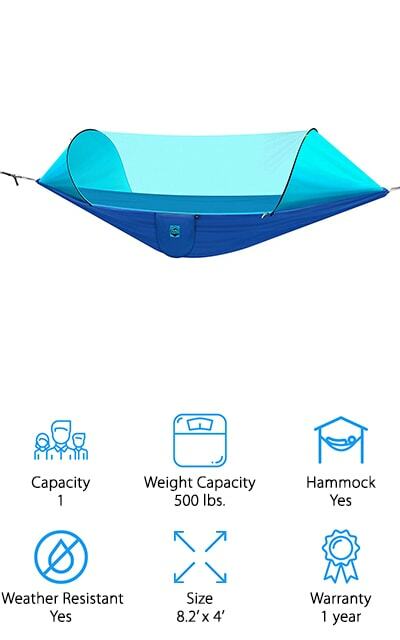 This hammock tent is available in 2 different colors and rated at over 440 pounds, which is enough for 2 average size adults to sleep comfortably. It includes a tunnel style mosquito net that has reversible zippers to make it easy to open and close. Not only that but the design of the hammock means you can even use it as a sleeping bag or swing. Fold it up small to make it even more portable and you’re ready to go. This best hiking hammock is durable, breathable and antibacterial and even comes with everything you need to get set up. That means the carabiners and nylon ropes to make it safe and steady. Its lightweight enough that it will attach right to your bag as you’re hiking or fit easily in a small space when you pack up the car. This unique looking hammock is actually considered a suspended tent and gives you the ability to sleep off the ground, but not quite in a traditional way. 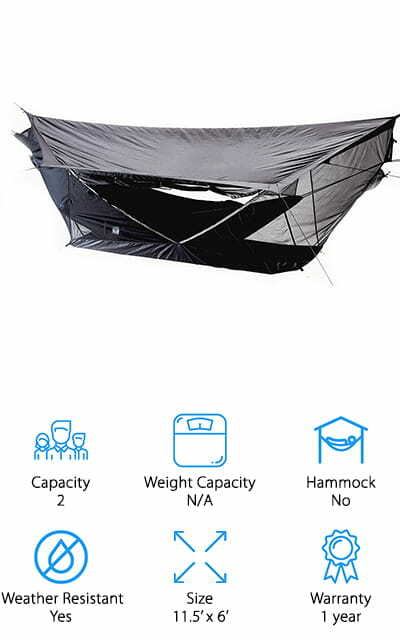 Made for 2 people to sleep comfortably, this suspended tent can be folded down easily to make it simple to manage. It also has a cross brace to give you additional headroom and has a single ratchet. The full insect mesh top even has a removable rain fly and 2 separate doors so you can easily get in and out while you’re camping. For times when you need a little less rain protection and a little more wind protection, you can even fold the rain fly under the tent to create a windbreak. 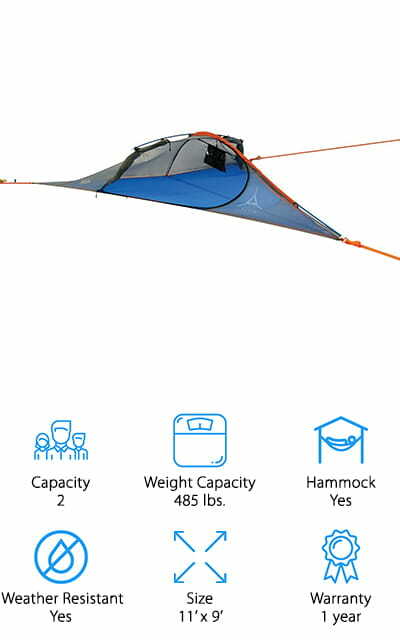 You’ll get several color options to give you some versatility on your favorite things and you’ll have the ability to support up to 485 pounds with this tent. It’s also great for taller users, up to 6’1”. Even in a dense forest you’ll be able to find the right place to set up your tent. If you’re going to be heading out into the wilderness with your hammock tent you’re definitely going to need something to protect you from the elements and that’s where this rain fly will come in handy. It’s a heavy duty tarp cover, but without the added weight that you definitely don’t want when you’re hiking anywhere. It’s made with a waterproof polyester to even help keep out the sun and cool air to help you stay comfortable. It folds down anywhere you need it and can be used anywhere you need it, without a hammock stand. The reflective tracers mean that it’s easy to see once you set it up and the tension guy lines mean that it’s secure wherever you put it. You’ll have everything that you need included when you buy this rain fly, so you just set it up and go. 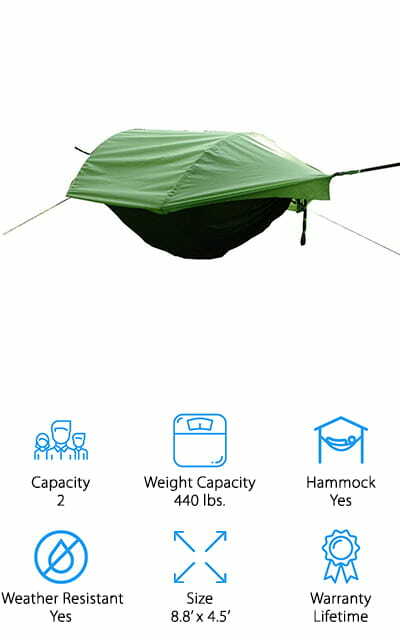 This top hammock tent is capable of holding up to 440 pounds, which means that it can hold 2 average adults comfortably. Not only that but it’s complete with nylon ropes, carabiners, mosquito netting and a case to carry everything in so you can be secure and comfortable. Available in several colors, this hammock is quick drying as well as being mildew and rot resistant. Use it as your new favorite hammock, a sleeping bag or just about anything to get plenty of versatility. With this lightweight tent, you actually get a frame that keeps the net up and away so you’re comfortable and protected without feeling suffocated. Just hang it up between a couple trees and you’re going to be off to a great night. 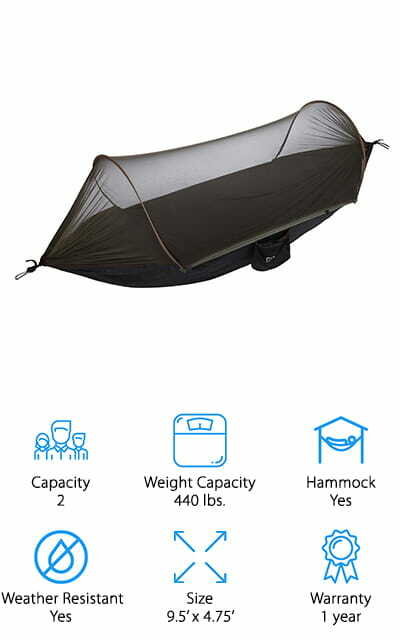 This hiking hammock tent actually comes with plenty of additional features and extras. You get the hammock itself with mosquito netting as well as a rain fly, compression sack, tree straps, nylon ropes, carabiners, and stakes. That means you can quickly and easily get the hammock set up exactly where you want it in no time. Able to support up to 350 pounds, this is a great option for anyone who wants to head out into the wilderness or even just spend some time in their own backyard. Everything can easily be stored in the compression sack so it’s ready when you are and it weighs less than 4 pounds. Set up the tent in as little as 3 minutes with a few simple to follow instructions. Water resistant and ready for just about anything Mother Nature will throw at it, this hammock is definitely one that you’ll be looking for next time you head out for the night. This hammock tent is one that’s going to give you a bit of everything that you need. It’s designed to provide plenty of space for 2 people to sleep comfortably and to keep the bugs and other inclement weather out of your way. You’ll be able to stay dry even in the rain and you can easily hang your hammocks under the shelter. It’s made with a ripstop material that keeps it more durable and it’s easy to hang or to stake into the ground. Within just a few minutes you’ll be able to get the entire thing set up and get your hammocks undercover. When you’re ready to head out everything folds up small and fits into the stuff sack so you can store it in your pack or anywhere else. It’s ready to go at a moment’s notice just like you are, and lets you and your camping partner enjoy the trip. 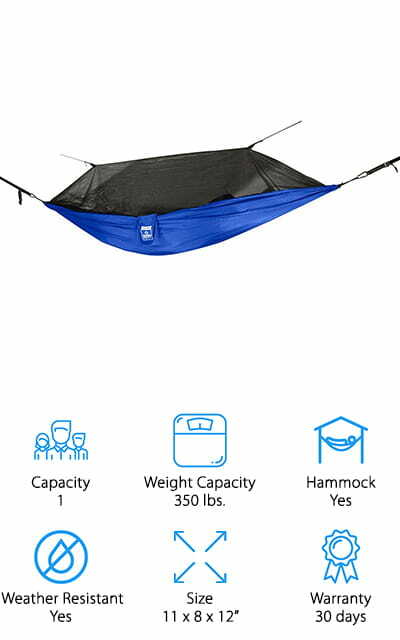 This brilliant blue hammock definitely looks pretty cool and it comes with everything you need to get it set up too. You’ll have the hammock, bug netting, straps and carabiners and even a sack to put everything in when you’re transporting it. It’s designed to keep you comfortable and protected from insects while you’re enjoying a night out under the stars. You’ll even have a loop for hanging a light and a storage pocket on the inside to keep your things out of the way. Made in the United States, this hammock comes with a satisfaction guarantee, so if you’re not happy for any reason you can contact the company for help. Rated for up to 500 pounds, this hammock can be used for 1 person sleeping or 2 sitting and relaxing, so you can have a whole lot of fun. 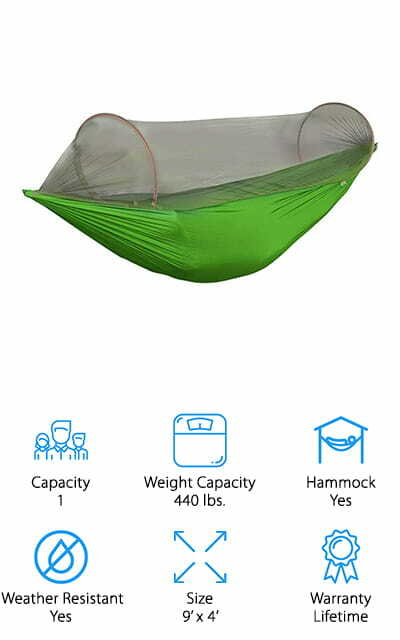 This large camping hammock tent comes in several different colors for your personal preference and even has a mosquito net to keep bugs away. If you don’t want the netting then you can flip the hammock around and put the net underneath so you can sit and relax and just enjoy the air. Lightweight and made with heavy duty parachute material, this hammock is also breathable and antibacterial. It’s able to hold up to 400 pounds and is super easy to set up, so you can enjoy yourself instead of spending all your time working on your hammock. There’s a lifetime warranty on the hammock too, which means if anything happens you’ll get a replacement or your money back, no matter when it happens. Get all of the ropes and carabiners as well as a compression sack that holds everything where you need it. This hammock tent is designed to keep out bugs and rain with no problem. You get a translucent mesh net that keeps out just about any kind of insects including mosquitoes and fleas as well as a waterproof rain cover that keeps you dry, blocks out sun and keeps out the snow. All it takes is a couple minutes and you’re ready to go too, which is even better. You’ll have a compression sack to hold everything, the rain fly, mosquito net, hammock, ropes, stakes, carabiners and more to make sure you’re prepared right out of the gate. 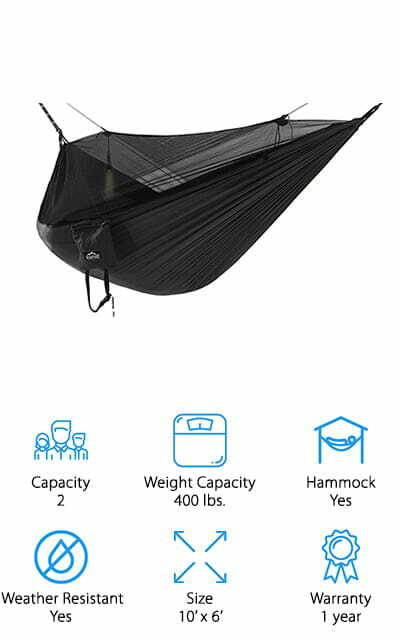 Light and easy to carry, this hammock can support up to 440 pounds or 2 average adults. It even has a breathable surface that’s soft but still strong. Use it as a sleeping bag, a regular hammock or a tent whether you’re out for the night or for a long trip.